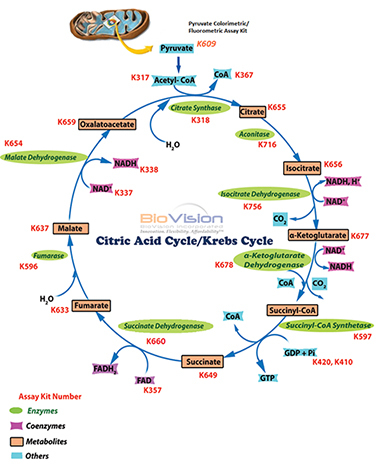 Krebs Cycle | BioVision, Inc. The Krebs Cycle, also known as Tricarboxylic Acid (TCA), is considered one of the central pathwasy in cellular metabolism. It oxidizes several metabolites containing acetyl groups. The list includes amino acids, carbohydrates and fatty acids. BioVision offers the most complete series of assays measuring various metabolites, cofactors, and enzymes involved in the glycolytic pathway. BioVision has developed a highly sensitive assay for determining Acetyl CoA level in a variety of biological samples. BioVision’s Citrate Synthase Activity Assay Kit, Citrate Synthase reacts with substrate mix to form an intermediate, which subsequently reacts with developer to generate the colored product. BioVision’s NADH/NAD Quantification Kit provides a convenient tool for sensitive detection of the intracellular nucleotides: NADH, NAD and their ratio. The NADP/NADPH Quantification Kit provides a convenient tool for sensitive detection of the intracellular nucleotides: NADP, NADPH and their ratio. BioVision’s FAD Assay Kit, FAD functions as the cofactor of an oxidase which catalyze the formation of a product that reacts with OxiRed probe generating color and fluorescence. The Phosphate Colorimetric Assay Kit provides an easy, quick and sensitive means of assessing phosphate over a wide range of concentrations. The assay utilizes a proprietary formulation of malachite green and ammonium molybdate. This Phosphate Assay Kit provides a sensitive, easy and quick means of assessing Pi over a wide range of concentrations. 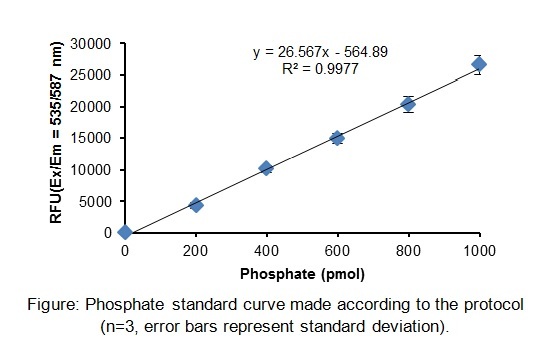 In this assay, inorganic phosphate reacts with sucrose to produce glucose-1-phosphate in the presence of a proprietary enzyme. 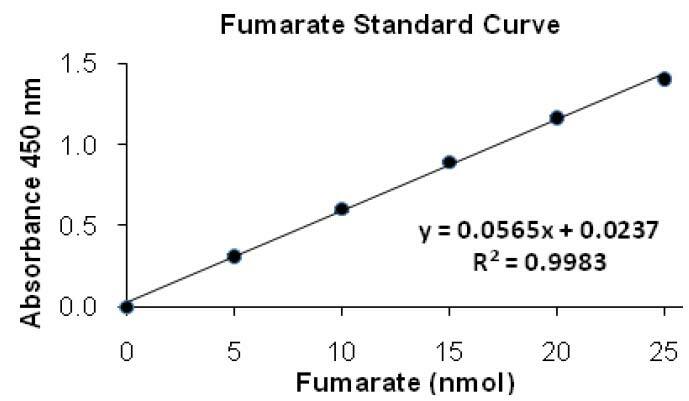 Biovision’s Fumarase Activity Assay kit provides a quick and easy method for monitoring fumarase activity in various samples. In this kit, fumarase converts fumarate into malate, which then reacts with Enzyme Mix to form an intermediate. BioVision’s Succinyl-CoA Synthetase Activity Assay, SCS converts succinate into succinyl-CoA in the presence of ATP and CoA. BioVision’s Fumarate Assay Kit provides a convenient tool for sensitive detection of the fumarate in a variety of samples. 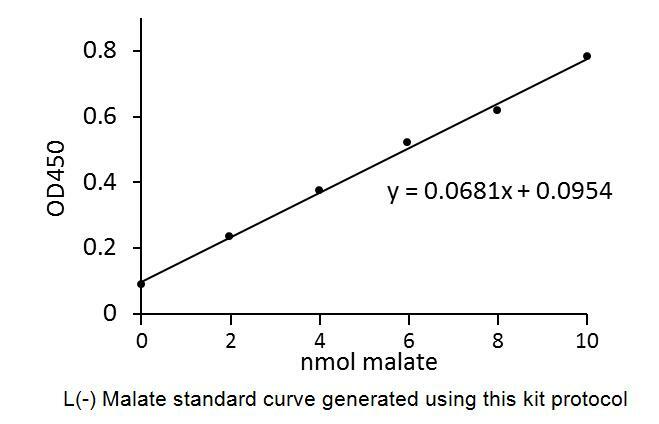 BioVision has developed an easy and sensitive assay to measure the L(-) Malate level in a variety of samples. BioVision’s Succinate (Succinic Acid) Assay kit is a sensitive, fast and easy-to-use kit. In this assay, Succinate is utilized by Succinyl-CoA Synthetase to form an intermediate, which undergoes a series of reactions & reduces a colorless probe to a colored product with strong absorbance at 450 nm. BioVision’s Malate Dehydrogenase Activity Assay kit, MDH reacts with malate to form an intermediate. 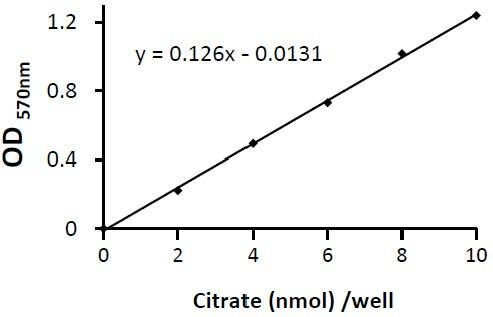 BioVision's Citrate Assay Kit provides a simple, sensitive and rapid means of quantifying citrate in a variety of samples. In the assay, citrate is converted to pyruvate via oxaloacetate. BioVision's Isocitrate Assay Kit provides a simple, sensitive and rapid means of quantifying isocitrate in a variety of samples. 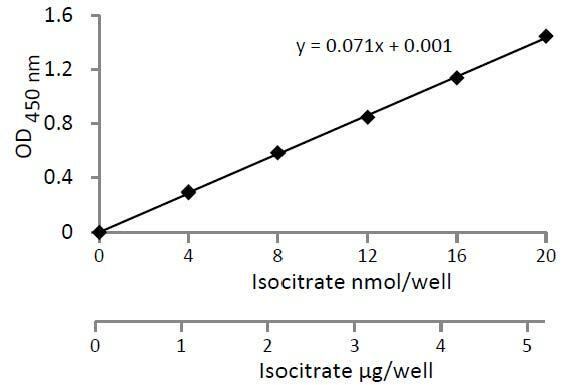 In the assay, isocitrate is oxidized with the generation of NADPH which converts a nearly colorless probe to an intensely colored species with a λmax of 450nm. 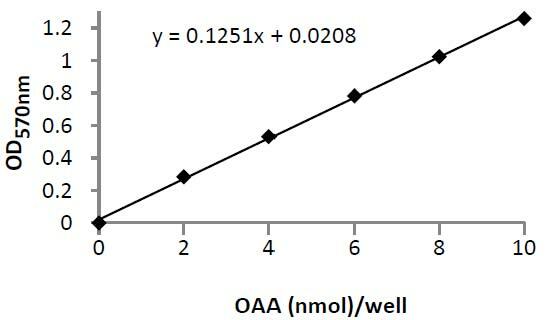 BioVision's Oxaloacetate Assay Kit provides a simple, sensitive and rapid means of quantifying OAA in a variety of samples. In the assay, OAA is converted to pyruvate which is utilized to convert a nearly colorless probe to an intensely colored and fluorescent product. BioVision’s Succinate Dehydrogenase Activity Assay kit is rapid, simple and high-throughput adaptable. In this assay, Succinate dehydrogenase converts succinate to fumarate, and transfers the electron to an artificial electron acceptor, which changes the color from blue to a colorless product. 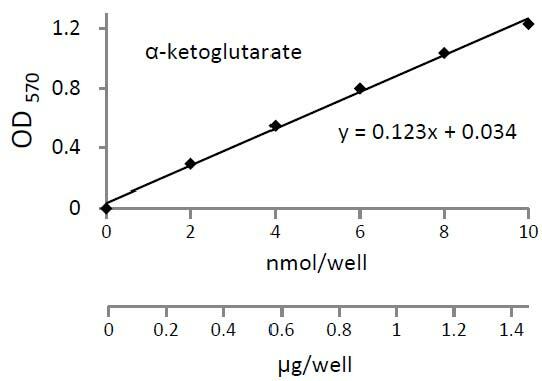 BioVision's α-Ketoglutarate Assay Kit provides a simple, sensitive and rapid means for quantifying α-KG in a variety of samples. In the assay, α-ketoglutarate is transaminated with the generation of pyruvate which is utilized to convert a nearly colorless probe to both color and fluorescence. BioVision’s α-KGDH assay kit provides a quick and easy way for monitoring α-KGDH activity in various samples. In the assay, α-KGDH converts α-ketoglutarate into an intermediate which reduces the probe to a colored product with strong absorbance at 450 nm. BioVision’s PDH assay kit provides a quick and easy way for monitoring PDH activity in various samples. In the assay, PDH converts pyruvate into an intermediate, which reduces the developer to a colored product with strong absorbance at 450 nm. BioVision’s Aconitase Assay Kit is a highly sensitive, simple, direct and HTS-ready colorimetric assay for measuring Aconitase activity in biological samples. In BioVision’s ALT Assay Kit, ALT catalyzes the transfer of an amino group from alanine to ⍺-ketoglutarate, the products of this reversible transamination reaction being pyruvate and glutamate.